Over the course of time, artistic ideas often phase in and out of artists’ work. Sometimes an idea will emerge, take form and recede only to re-appear a number of years later in a related but distinct interpretation. Such is the case with F/F’s three sculptural wall pieces: Figure1, Figure 2 and Figure 3. Figure 1 from 2003 is part of F/F’s Nine series which they debuted at the Philadelphia Craft show. Nine was conceived as a series of nine visually unique wall sculptures that happened to incorporate detachable jewelry items into the compositions. The composition, Figure 1, explores concepts of early 20th century cubism. Fragmented visual planes and a staccato rhythm of forms capture the mood and appearance of the groundbreaking artistic movement. The piece also echoes cubist sensibilities in its collage assembly. Composed of burlap applied to plywood, black gesso, printing letters, and portions of polymer inset into sterling silver bezels, Figure 1 recalls the collaged works of Georges Braque, Pablo Picasso and Juan Gris. 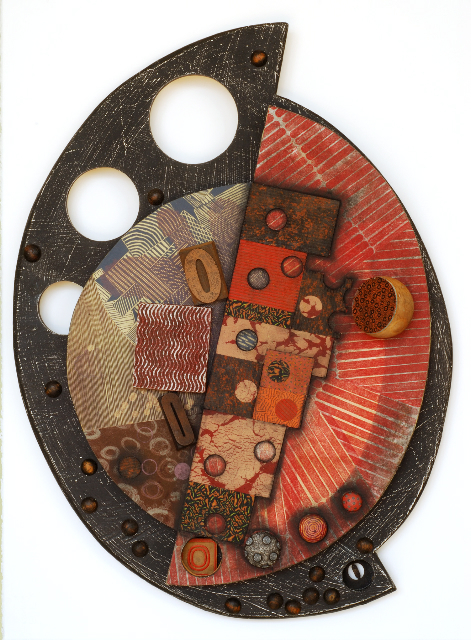 While intended to hang as wall art, F/F included two detachable brooches within this complex composition. The whole concept of Nine makes a direct statement about art jewelry being art. Figure 1 in particular expands the idea by evoking art of the past within a work of contemporary art that contains more art. Upon receiving a commission for a wall piece that would revisit Figure 1, F/F returned to the concepts presented in 2003. By incorporating found objects, collage techniques and an essentially monochromatic color scheme, elements of the cubist style and esthetic are still very much present in the two recently completed works: Figure 2 and Figure 3. However, since 2003 Ford and Forlano’s collaborative partnership has evolved. The two men no longer live in the same city, which means that aside from verbal and perhaps photo transmitted exchanges, these pieces were considered and created initially through each man’s autonomous interpretation. Eventually, both artists’ assortment of components was united and together, on site, Ford and Forlano determined the final direction for Figure 2 and Figure 3. While artistically connected to Figure 1, Figure 2 and Figure 3 also are decidedly different. Each of the two new pieces is larger in scale and comprised of bigger individual components. The background planes of both are now far more complex and filled with collaged areas of pattern. Surface additions are fewer, as well as simpler and particular pieces are generally larger in scale. This reverses the relationship of surface to background from Figure 1 where the background plane was fairly consistent and the surface was highly detailed. In both pieces the polymer inclusions are well integrated with F/F’s renewed interest in printmaking and painting. External contours are more irregular in Figure 2 and Figure 3, creating a dynamic effect that suggests an impetus to expand out from the demarcated space rather than turn inward as in Figure 1. However, unlike the density of core compositional components in Figure 1, the two new works take different forms. 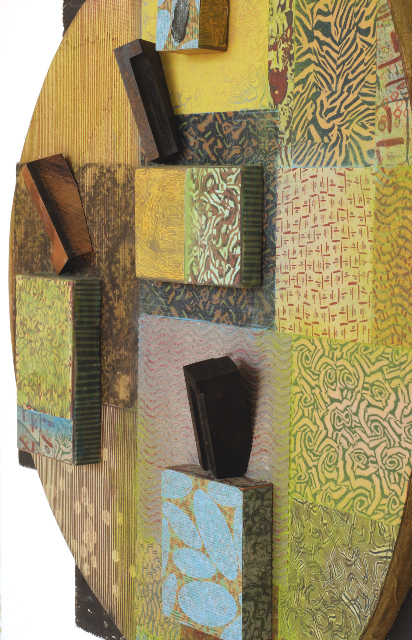 Figure 2 presents a coherent, integrated mix of collaged bits of wood, printed papers, found letters, paint and polymer elements that play upon a motif of square and round shapes. There is a strong sense of movement and torque as one looks at the piece. In Figure 3, a similar assembled blend of materials results in an angular, stationary composition. The viewer is confronted with a visually arresting piece that insists one stop and pay attention. Perhaps the most significant difference is in the intention of the new works. At the most basic level, Figure 1 is an artistic vehicle for the display of two well integrated brooches. With Figure 2 and Figure 3, neither piece contains any hidden jewelry assets. Ford and Forlano created art that only is meant to be art. When they first met, Ford and Forlano were both studying painting. They have recently returned to making art through an exploration of print making and paint. The incorporation of paper and pigment into their oeuvre, adds a further level of textural and dimensional duality as their collaborative conversation continues. “Last year, we got a call after the Fuller Museum show that featured some of our wall pieces from 2003. A Boston area collector liked the work and wondered if we would want to revisit some of the ideas in a piece called Figure #1. We agreed and were excited to be making something other than jewelry for a change. That was last summer……….. and finally, this week, I finished two pieces that were based on some proposed watercolor sketches that the client picked out. At first, I was more excited about the idea of making this work, while David was more excited about the actual making. 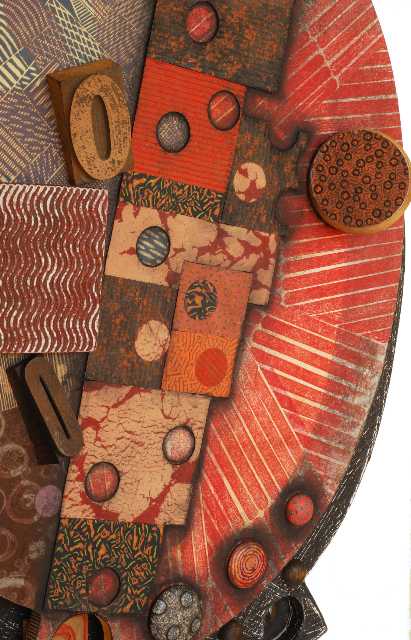 He made sheets of polymer clay pattern, and worked through ideas with some drawings of his own, in his Santa Fe studio. He brought these parts to Philadelphia in February, and we worked on developing a distinct and focused direction for each piece. A new element since the original Figure #1, is the print/painting collaboration that we’ve been doing (see earlier posts). Printed material was incorporated into both Figure 2 and Figure 3. I think it meshed well with the clay work.